Sterling Children's Books, 9781454921523, 40pp. 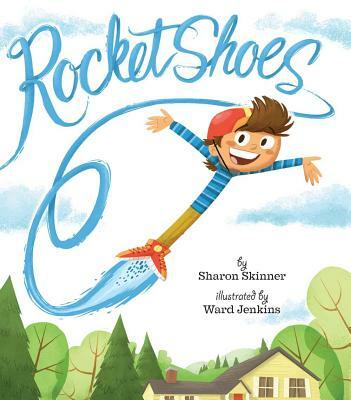 kick-start heels, and shoe-size rockets." A rhyming story for every kid who wants to fly--and wonders when it's okay to break the rules. Like all children, Jos dreams of flying. So he works hard to buy a pair of rocket shoes that let him jet into the atmosphere. But all those spins, kicks, and airborne tricks cause such a ruckus around town that the mayor bans the shoes and shuts down the factory. Then, one day, during a terrible snowstorm, Jos hears a cry: his neighbor's in danger--and he can only help her if he puts on the shoes. Will Jos dare to break the rules and save the day? Sharon Skinner grew up in a small town in northern California where she spent most of her time reading books, making up plays, and writing stories about fantastical creatures, aliens, monsters and, of course, heroes. She holds an MA in Creative Writing, a BA in English, and a Poetic License, and served for eight years as the Executive Editor of Anthology magazine, a small-press literary magazine published in Mesa, AZ. Sharon is an active member of SCBWI (Society of Children's Book Writers and Illustrators) and serves as the Assistant Regional Advisor for SCBWI AZ. Her published work includes The Healer's Legacy (YA Fantasy, 2012), The Nelig Stones (MG Fantasy, 2013), Mirabella and the Faded Phantom (MG Paranormal, 2014), and The Matriarch's Devise (YA Fantasy, 2015). She is also the coauthor of The Chronicles of Tavara Tinker series. You can learn more about her at sharonskinner.com. Ward Jenkins draws and animates from his home in Atlanta, GA, where he lives with his photographer/writer wife, Andrea, and two kids, Ava and Ezra. He has illustrated many books for children, including How to Train a T. Rex &Win 8 Gold Medals by Michael Phelps & Alan Abramson (Simon & Schuster), Chicks Run Wild by Sudipta Bardhan-Quallen (Simon & Schuster), and the Good Crooks series by Mary Amato (Egmont USA).